mimycri bags and backpacks are made from broken rubber boats that were used by newcomers to cross the Mediterranean. But what exactly does the transformation from boat to bag look like? We invite you to join us on this four-part journey to learn about the boats that become bags. Chios. Lesvos. Greece. A boat arrives, often, full of people. Too full, which means it is also broken and full of water. Landings are never easy, and they are always different because the individuals on the boats are unique in their own way. No one is the same. 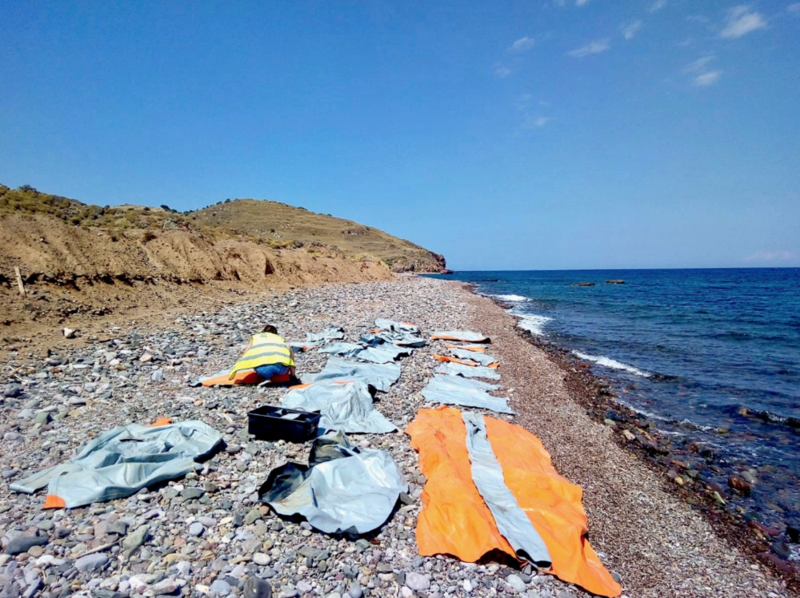 Part of the work being a volunteer in with Chios Eastern Shore Response Team (CESRT) and Lighthouse Relief in Lesvos is helping boats land safely. Disembarking passengers sometimes need to wade through water or swim to shore. Most boats arrive in the night when temperatures can be as low as 5 degrees. After everyone is safe on land, volunteers hand out food, water, and dry clothes. These are emotional moments, often full of fear due to the long hours of traveling on an overcrowded boat, uncertain of what was to come. And sometimes the moments are full of joy—finding land and it safety. There is no time to deal with the boats at the moment when people arrive. The priority is to make them feel welcomed, safe, and to attend to any medical needs. 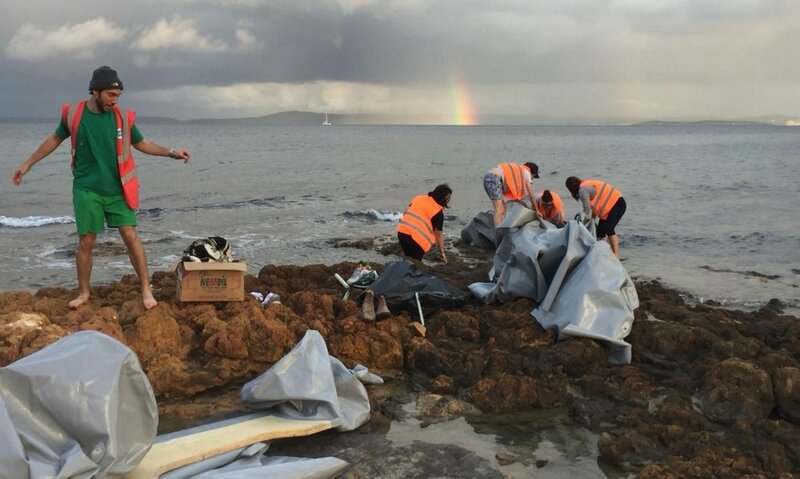 Hours or days later, when there are no arrivals, volunteers come back to beaches to clean them. There are no more people, only things, bearing witness of what has happened. The volunteers take the wet clothes and wash them to reuse them. They throw away the life vests. And since mimycri exists, they do not throw away the boats any more but collect them. The decision to get the boat out of the sand and rocks to collect it instead of throwing it away is the first moment of transforming a broken rubber boat into something new. The boat material is heavy and tough and often buried in sand or stuck in the rocks, requiring volunteers to see the value in putting in hard work to retrieve the rubber boats. The boat material is then brought to the warehouses until a decent amount of it has been collected. At this point, it is already not only a broken boat anymore, but through the work of volunteers has been transformed into a material that at one point will be used to create something new. And still, it has been a boat before. The material is cut, rolled, and packed into boxes. It carries its history of being a boat and the powerful symbolism of transformation. Whenever there is time, all boxes are packed on a pallet and leave the islands of Chios and Lesvos (often earlier than the people who have arrived on the boats) towards a new adventure, and a continuation of its story. Stay tuned for the next part of the bag journey to learn about the way from Greece to Germany.